Prince of Persia is Ubisoft Montreal's 2008 action adventure platformer. You play as a man only referred to as The Prince who at the beginning of the game is lost in the desert searching for his donkey who is apparently carrying a fortune in treasures. He comes across a damsel in distress, a princess as it would be, and together the two work together in trying to stop the evil king from unleashing an evil-er entity. 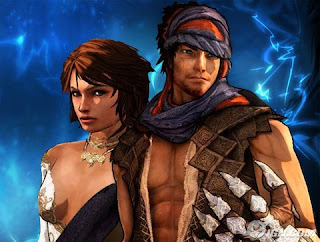 Prince of Persia is a game that focuses more on the platforming and interacting with the environment. You'll be spending 90% of your time leaping across canyons, running up walls and flying through the air. If you want a game that's combat heavy, then Prince might not be what you're looking for. The game is designed in a non-linear fashion. There are 24 different territories that you will have to travel through and complete, but the order in which you complete them is in your hands. In addition, every time you complete or "heal" a land, you essentially have to re-run it and explore other unlocked areas in order to find spheres of light (called light seeds) that empower Elika. So look forward to lots of running back and forth. The overall difficulty of the game is too easy, but after playing Dead Rising I more than welcomed this relaxing playthrough. Part of what makes it so easy is that you can never lose. Thanks to Elika's magic powers, anytime you take too much damage from enemies or make a wrong jump into a pit, she will save you before you meet your end where you can try again. This does take a lot of the challenge away. Prince of Persia is definitely ambitious in design with quite high production values. The cel-shading graphic style is definitely pleasing to the eye balanced by backgrounds that are fully rendered in the 3D with lush colours. The score for the game is beautifully done often giving it a really majestic and Arabian feel. As you're running up walls or jumping across chasms, the music makes it truly feel like you're in some grand adventure like in Lawrence of Arabia or something. Besides the difficulty of the game, the only other thing to complain of is the the voice work. The voice of the Prince sounds like that of a modern day American man and kind of ruins the feel of being in a mystical place and time. However, on the plus side, the witty banter and dialogue between Elika and the Prince is charming and funny, definitely something to look forward to. It's also amusing to see their attitudes change as the game progresses; they are more attracted to each other, and it plays out in the dialogue. They even throw humourous sexual innuendos in there, which I thought was hilarious. Prince: "You know what they say, the bigger they are..."
Elika: "...The more they boast about it." The replayability of the game leaves more to be desired, given that the game's difficulty is low and that the achievements were too easy to complete (in one playthrough, I was able to unlock 48 of the 50 achievements, definitely too easy). For this reason alone, I can't recommend buying the game brand new, but perhaps wait until you can find a used copy for around $30. Check it out if you'd like, if anything, just to see the beautiful graphics as well as to hear the witty dialogue. That's it for now, later geeks! Lovely review, I particulary liked the way you've dicussed the dynamic between the two characters. I didn't get a chance to finishing Sands of Time either, started it, but never got into it enough. I might revisit all the old ones. Anyhow, thanks for your patronage.